For my fifth and final cupcake this week someone gave me a brilliant idea to make cupcakes with faces which made me step back and look at all of my cupcake stamps in a new light. For the cupcake top I inked around the edge of the stamp omitting the line in the center of the frosting so I could draw the face in the blank space after I stamped the image. Now, if I could draw I probably wouldn’ t be stamping so please forgive my modest smiley face. The top is coloured with Copic markers and the bottom is coloured with Gelly Roll Glaze and Metallic pens. 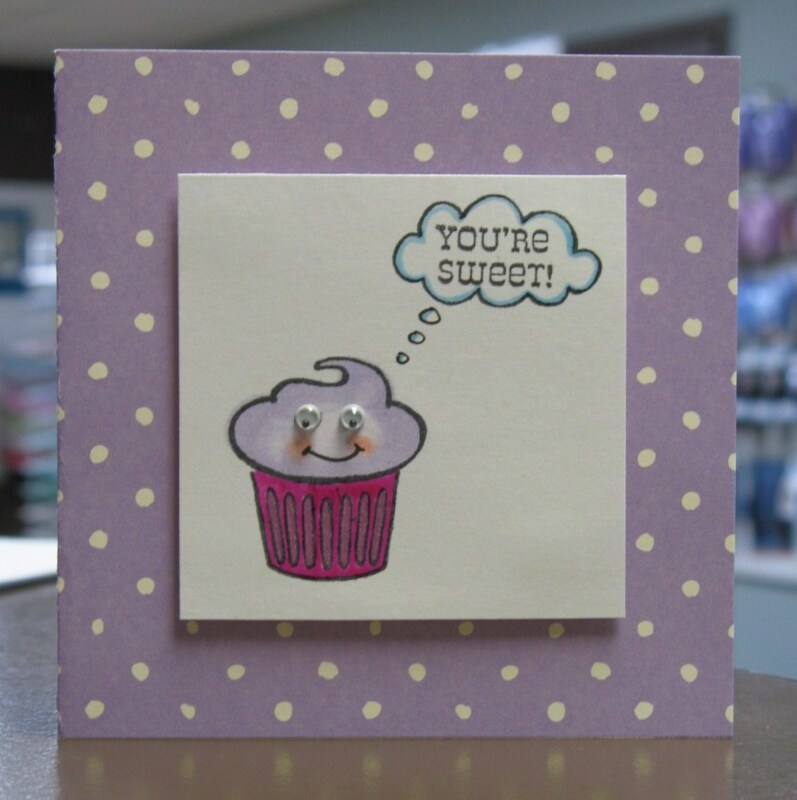 I used another “frosting” top from the Cupcake Builder set to make the little “thought bubble” and the sentiment is also from that set. I actually cut the sentiment apart so I could stagger it – my acrylic block has a grid on it, so whenever I need to line up my stamp all on the same line it’s easy peasy – I cut apart 90% of the clear stamp sentiments I own whether they are staggered or all on one line – I find this adds a lot of versatility to the stamps. Hope you all enjoy your weekend! Don’t forget to check out the Get Baked Art Exhibit on February 5th-7th at the Arts & Culture Center if you’re in the St. John’s area.